Synchronized clock-time: (9:35) We know that clocks measure time. And in our business meetings with participants from different continents, our clocks are usually synchronized. However, that is an approximation. Rovelli says we live in the “Netherlands” of space-time region – which is very flat. And even in this region, atomic clocks with an accuracy of 10-17 second show that one atomic clock placed 40-50 cm above the other runs faster than the one below. The conclusion is staring at us: Our head is older than our feet. And there is no such thing as synchronized clock-time. We both have the same NOW: (14:00) When we watch a live telecast of a match, we know that everybody is watching the same thing. But are we watching it NOW? No. We are watching it with a delay of a few seconds. If you are visiting Mars and I am on Earth, our NOWs are separated by 3 minutes. And we have not even taken our relative speeds into consideration. In short, Rovelli points out that there is no universal NOW. We all live in a local NOW bubble which has a length given by the speed of light. Disorder grows in the future: (20:45) Second law of thermodynamics says that entropy which in layman terms means disorder grows in the future. For example, if we have a box with green balls on one side and red balls on the other side, we would call it order. And then if we mix them, we could say that the disorder has increased. Rovelli asks, “But, what if a colour blind person watches this transition? Would he say that the disorder has increased?” Perhaps not. Rovelli points out that if the universe looks more ordered in the past, it doesn’t mean the perceived order is a property of the universe. It just means we, the observing sub-system, has chosen a set of variables that makes us see it more ordered in the past. What could be that perspective from which disorder may not grow in the future? That leads us to the next property. 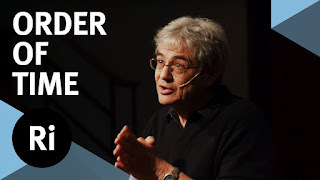 Time is continuous: (33:05) What Rovelli’s research in Loop Quantum Gravity (LQG) suggests is that if we look at the time at sufficient granularity i.e. divide time in small intervals, say of 10-44 second each, then time is no longer continuous. Every unit of this granular entity is independent. If a stone seems to carry the same structure over a long period, then it means the quantum process at each event of this granularity is expressing itself in a similar way at least as far as our perception is concerned. Experience of time flowing: (44:15) Towards the end of the talk, Rovelli turns to the question, “All this is fine, but what about the flow of time I experience?” He considers the possibility that perhaps all these properties physicists study don’t capture something about time which creates a flow of experience. This is where he steps outside his field of expertise to neuroscience. He suggests a possibility that the flow of time is an outcome of neurological processes. Perhaps the human brain is a time machine which creates an emotional fog around the memory traces it weaves and calls it life and that fog doesn’t allow us to see the real nature of time. In fact, he interprets Buddhism’s second noble truth which emphasizes impermanence as “time is the source of human suffering”. After all, we lose things because of time. And what we are most afraid to lose is oneself – i.e. death. As a student of mindfulness, the illusion of time has been an important area of exploration for me. The talk shed light on some aspects of time which were new to me especially I found the perspective on the second law of thermodynamics insightful. 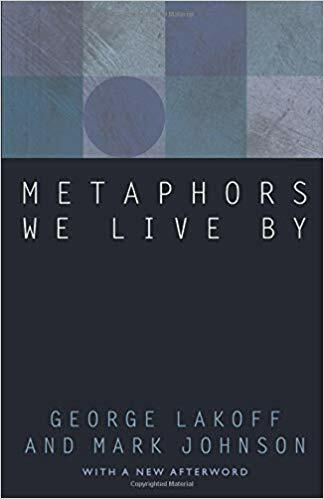 “Metaphors we live by” by George Lakoff and Mark Johnsen was in my to-read list ten years ago when I read about metaphors in Chip & Dan Heath’s “Made to stick”. However, I never got around to reading it until recently. During last decade metaphors, for me, went from being a useful communication tool to a dominant ever-present lens. “Metaphors we live by” was published in 1980 and it explores the roles metaphors play in shaping our thinking process. Here are my three takeaways from the portion of the book I have read so far. Our thinking is metaphorical: Traditionally, we look at metaphor as a linguistic concept – perhaps more relevant to poets and writers. The book makes a bold claim quite different from this belief. It says, “The most important claim we have made so far is that metaphor is not just a matter of language, that is, of a mere word. We shall argue that, on the contrary, human thought processes are largely metaphorical.” That means metaphors are deeply ingrained in our thought process. For example, if we believe “life is a journey”, then we would use expressions like – This is an important milestone for me, I am stuck, It has been a long bumpy road, I am at a crossroad etc. However, if we believe “life is a gambling game”, then the expression used could be – We’ll have to take our chances, I am betting big on this, The odds are against me, Play your cards right, He is keeping it close to his chest. Lakoff and Johnsen write, “The way we think, what we experience, and what we do every day is very much a matter of metaphor”. Metaphors provide experiential understanding: Lakoff and Johnsen say that the primary function of a metaphor is to provide a partial understanding of one kind of experience in terms of another kind of experience. My favourite example is the way Dr. Venkataswamy, founder of Aravind Eye Care, framed the challenge while starting an eye hospital in Madurai more than forty years ago. Dr. V asked himself, “How might we make eye care delivery as efficient as McDonald's?” Many of us have some experiential understanding of the efficiency of McDonald's. We don’t associate a hospital visit to a visit to McDonald's. But by asking this question, you start associating a known experience to a new experience you want to create. This example also highlights how we use metaphors – by highlighting one aspect of the experience (efficiency) over other aspects (say, product, business model or marketing). Metaphors can create a new reality: “Time is money” is how most of us think. We invest time, waste time, save hours by working from home, spend time judicially, run out of time etc. The authors say that the Westernization of cultures throughout the world is partly a matter of introducing the TIME IS MONEY metaphor into those cultures. Some of the tribal cultures even today don’t think in terms of investing, saving time etc. Perhaps for some “Time is a river” – ever flowing, ever new. When I first considered “Human life is like a wave in the ocean” as a serious possibility more than twenty years ago, I was deeply shaken. It had serious implications on some of the core concepts like progress, success, death etc. I had to explore further to see what emerges as a new reality. Hence, some metaphors are called “generative metaphors”. They help you ask new questions you hadn’t asked before and they help you see a new reality not perceived by your senses. To summarize, we looked at three aspects of metaphors. Our conceptual system is permeated with metaphors, metaphors try to express one experience in terms of another, and metaphors have the power of creating a new understanding. The book is concept-heavy. However, it uses plenty of examples to illustrate the points. “Metaphors we live by” is potentially an eye-opener. An interview forms an important experiential element in my design thinking workshops. Sometimes participants interview strangers on the road, in a mall or on the campus etc. Other times, they interview other participants. Are there any core elements of an empathic interview? Let’s explore in this article. Listening: Sometimes, we have paired interviews in the class. Partner-1 interviews partner-2 for 5-10 minutes and then they switch their roles. This is where I notice confusion in some participants. They lose track of their roles as an interviewer or an interviewee. And the interview turns into a discussion. 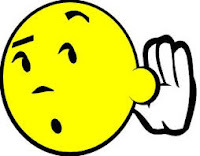 Listening is perhaps the most important element of an empathic interview. Many times the interviewer also has knowledge and opinions on the topic (s)he is interviewing on. And hence, the interviewer also starts sharing his own experience. This is likely to influence the interviewee’s response. Hence, the interviewer should focus on listening. I suggest 80-20 rule i.e. interviewer should talk 20 percent of the time, and interviewee 80 percent. But the urge to speak is sometimes very powerful. Moreover, interviewer’s listening can be hampered if the voice in the head is constantly judging what is being heard. It needs watchfulness or alertness. Appreciation: Imagine two executives in formal dress interviewing a security guard near the security gate of their office. The interviewers may have good intentions of understanding the security guard as a person and nothing beyond that. However, the security guard might feel vulnerable. A complaint from any of these interviewers and he could lose his job. What is the chance that he would speak from his heart? Very low. Hence, it is important to try to make the other person feel comfortable. How does one even attempt to communicate that, as a human being, the security guard has as much dignity as anyone else? It is not easy. However, one way to begin this communication is by spotting something about the person noteworthy and appreciating it. For a security guard, it could be his vigilance ability, or his ability to stand under the hot sun or his ability to work long hours etc. For a person who might be feeling, “I am not worth much”, this ability-specific appreciation could go a long way in restoring self-confidence. Whether it is a security guard or a CEO or a struggling student, everybody carries bright spots – things that are worth appreciating. The interviewer needs to develop the skill to spot these areas and appreciate them. Elaboration: Imagine you are interviewing a senior manager who is very busy. She is struggling to give quality time to her family. She mentions that she has registered for an online course to learn “Machine learning” but she is falling behind in terms of class schedule. Now, she is articulating this story with a bit of frustration. However, it would be good for the interviewer to see her willingness to learn despite being busy as a bright spot worth appreciating. However, appreciation is not enough. This is an area where there may be important information about how this person finds time for online learning despite her busy schedule. Does she listen to her lectures during commute time? Or late at night? Does she have buddies at work for this course? Does she get time to read the textbook? Is her spouse supportive? Every bright and dark spot offers an opportunity to learn more and hence elaboration plays an important role in empathic interviews. This can be looked upon as a context discovery process. When she is learning, what is the surrounding context that is enabling the learning process? People, devices, processes etc. Thus context curiosity is critical for elaboration. In short, we looked at three core elements of an empathic interview: listening, appreciation and elaboration. Perhaps you can use this as a checklist while interviewing.